Kat Burke was born in Cambridge, Massachusetts and raised in Fairfield County, Connecticut. Since graduating from Mount Holyoke College with a degree in Neuroscience & Behavior, she has spent over 10 years working in non-profits for social justice. In 2011 she graduated from the University of Hawai'i at Mānoa with a masters degree in public health. She is now pursuing her doctorate in public health there. Kat's passion is reclaiming ancestral, cultural wisdom to achieve health equity. 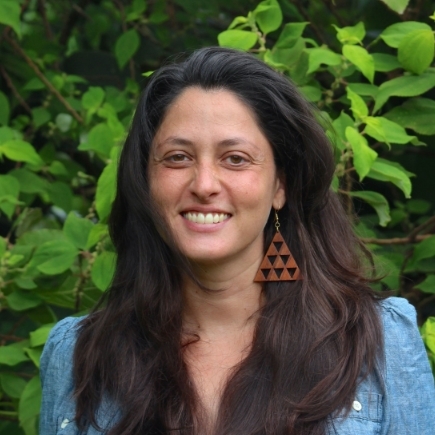 In that capacity she has spent the last 6 years at Kōkua Kalihi Valley working on indigenous evaluation system development for Ho'oulu 'Āina and Ehuola 'Ohana Health Project, funded by the Office of Hawaiian Affairs. Her published works focus on performative evaluation methods and community-owned data. Kat is on the board of directors for Hawai'i People's Fund and the School of Public Health Alumni Association. In 2011 she was honored during Women’s History Month by the Honolulu County Committee on the Status of Women as an "Inspiring Woman." In her spare time she enjoys pulling weeds and developing her apothecary.